Simple Sudoku makes high quality puzzles that are symmetrical, have a single solution, and do not require trial & error to solve. The user can also choose between five levels of complexity - from Easy to Extreme. Each puzzle is generated randomly so there is an almost limitless selection. 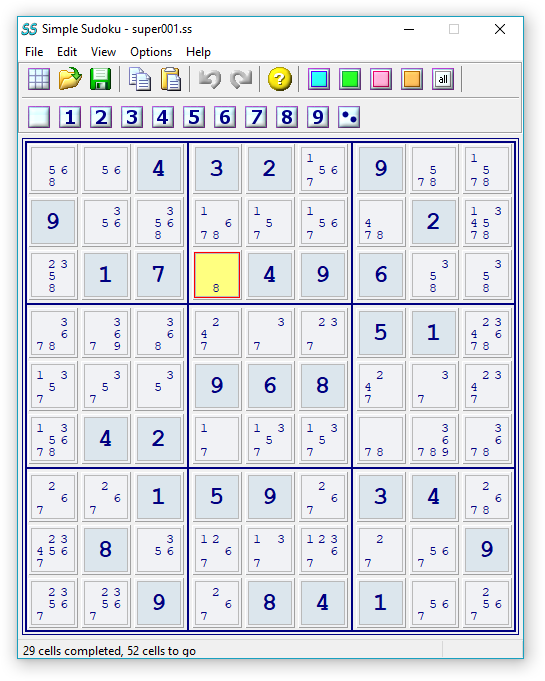 Not only does Simple Sudoku make challenging puzzles, it also provides tools to help solve them - removing the drudgery but not the fun. Keeping track of possible values for blank cells (candidates), providing filters and color markers are just some of the tools available to make solving even those really tricky puzzles possible. Also, if you ever get really stuck, Simple Sudoku can get you started again with a discreet hint (without giving everything away). It's free, but for private use only. Puzzle can be resized according to preference. My step-by-step guide to solving Sudoku. I get more email than I can sensibly manage so if you want extra help with Sudoku please ask for it in the Sudoku Programmers Forum. While I may not answer your questions, other Sudoku enthusiasts are likely to help. Also, please understand that, while I'm a moderator, I'm not the owner of the Programmers Forum and people ask questions there about Sudoku made from a number of Sudoku programmes. Finally, requests for improvements will probably be ignored since I'm unlikely to make further changes to Simple Sudoku. Looking for a great present to give to your friends or family members? I can highly recommend Gold Spike Deluxe Sudoku from Elverson PuzzleTM. I've just received a few boxes from Jim TerBush and I'm delighted with them - they're absolutely top notch! Thanks Jim!